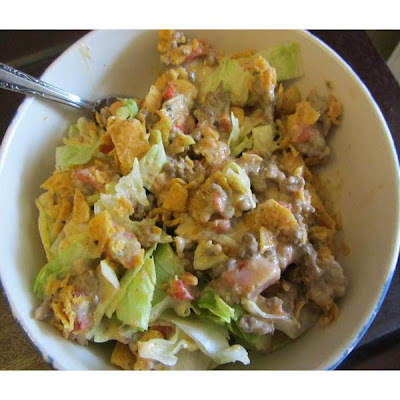 When we were kids, my Mom would fix Mexican Salad as a spicy treat 3 or 4 times a year. The recipe is super easy, but it may bring on a food coma after consuming. It is a great dish when you are tired of having the same old thing every week. Mix things up with this quick meal. In a skillet cook the ground beef completely and drain. Set aside. Cut up lettuce and place in bowls. Set aside. In a microwavable dish, place cubed pieces of Velveeta. Heat for 2 minute increments and stir. Repeat until almost all of the lumps are gone. Slightly drain the Rotel and add to Velveeta. Add in 1/2 cup of milk. Heat for 2 minutes. Stir and repeat until combined well and there are no lumps in the Velveeta. Add ground beef and stir together. Once combined, pour a couple spoonfuls over the lettuce. Add Frito's if desired. This dish is great for a quick week night meal. Do you have a meal that you pull out of the recipe box when you want to spice things up? Share your recipe with us.